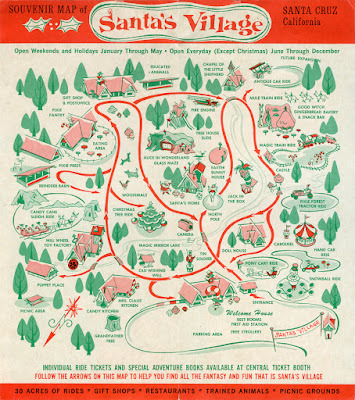 Original souvenir map of Santa's Village in Scotts Valley. 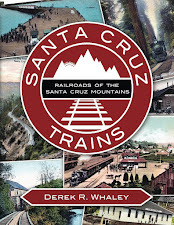 When one thinks of railroads, even miniature ones, in Santa Cruz County, the long-departed Santa's Village amusement park in Scotts Valley does not usually come to mind. And for many good reasons, it should not, yet for the entire length of its operation, a small diesel-powered railroad ran around a loop entertaining children and adults of all ages. Santa's Village—sometimes called Skyforest—was the brainchild of H. Glenn Holland, a property developer from Southern California who had already built a similarly-named park at Lake Arrowhead in May 1955, six weeks before Disneyland opened in Anaheim. 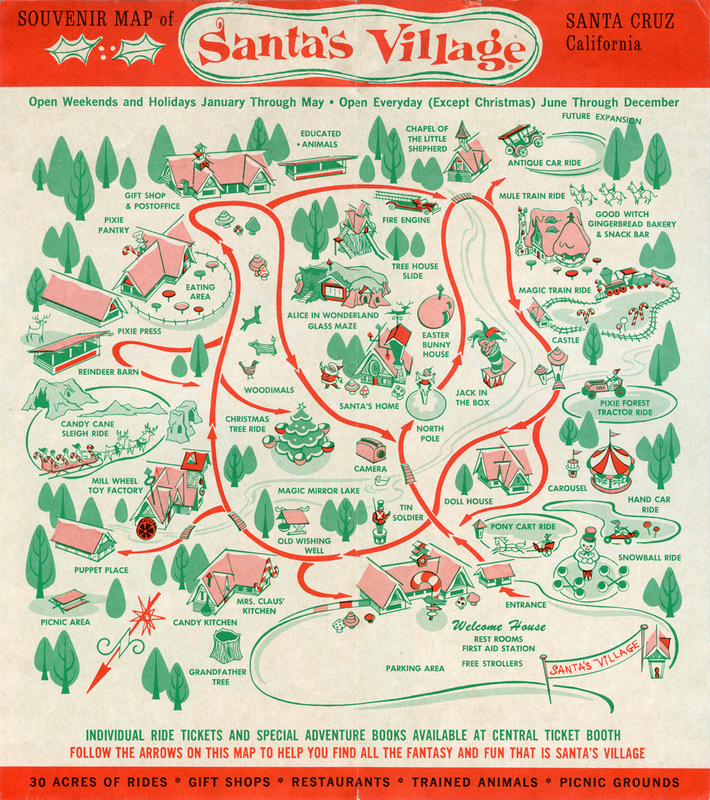 In 1957, his Santa's Village franchise became the first to become a chain of amusement parks, with a park opening in Scotts Valley that year, and another park opening in East Dundee near Chicago in 1959. Plans to built two more parks in Virginia and New Jersey were never realised. The Scotts Valley venue was opened on May 30, 1957, on 25 acres of the Lawridge dairy farm which Holland had leased the previous year. Richard Bellack, the resident manager, operated the park as a franchise for the first two summers before selling his role to Bruce Prather. 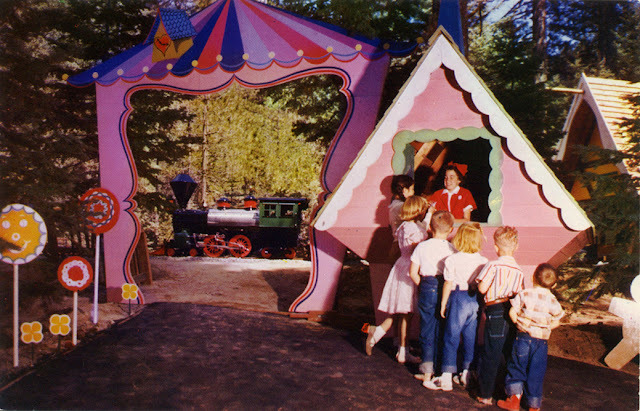 Among the opening day attractions was the Santa's Express Train which operated under the name "Magic Train Ride". This 14-inch gauge miniature railroad mimicked the appearance of a generic steam engine from the 19th century, although in actuality a diesel motor drove the train. It was built by the Hurlbut Amusement Company in Buena Park, California. 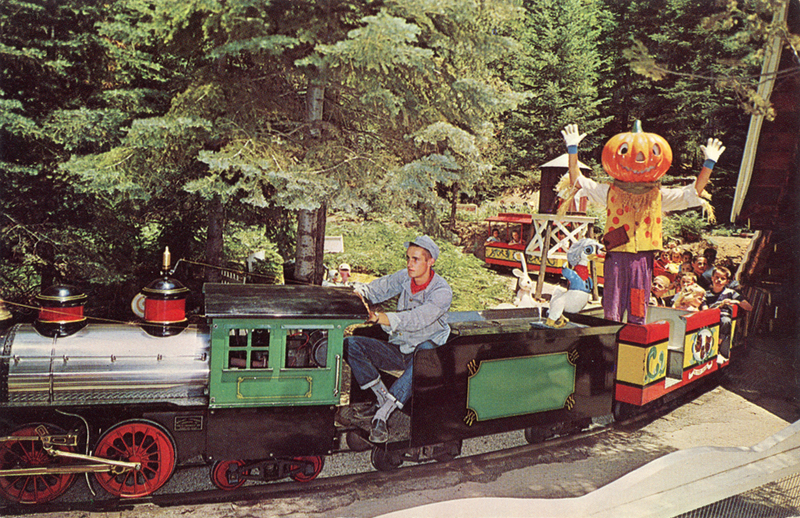 Bud Hurlbut's operation was famous regionally for building the trains at Knott's Berry Farm, where he operated a concession for decades. It was a relatively simple design with around five painted wooden passenger cars that could see four adults (uncomfortably) or eight mid-sized children in front/back facing seats. The single operator sat perpendicular to the locomotive in the tender car. 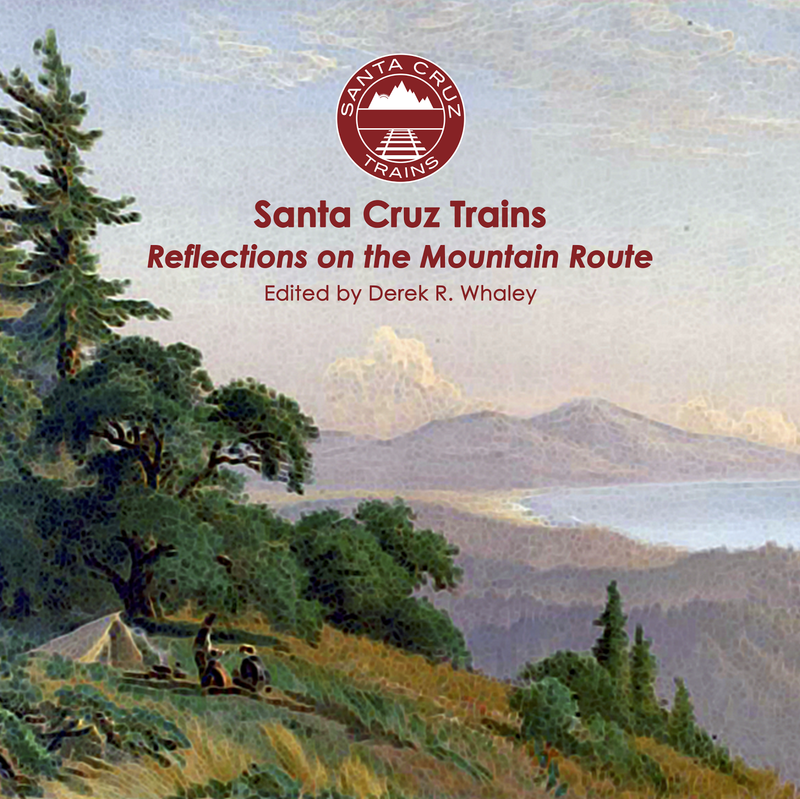 The train ran around a relatively short circular track which was decorated with an assortment of vegetation. What Christmas theme existed along the route has not been documented or commented upon. Santa's Village was never a very successful venture, especially once the East Dundee park opened, which was more expensive to run and unable to operate in cold weather conditions. The board of trustees revolted in 1965, forcing Holland to sell all his parks. 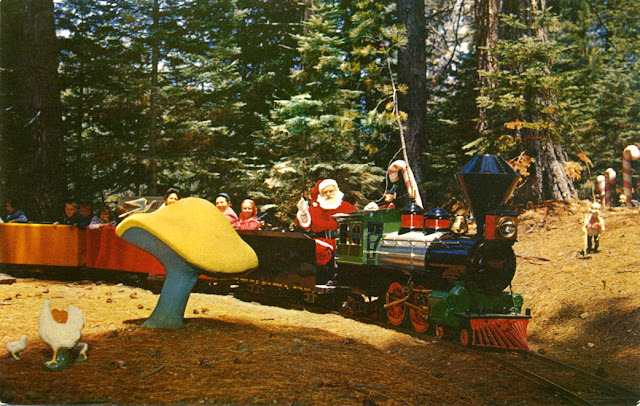 The Scotts Valley park passed to Noorudin Billawalla in 1966, who operated it under the name Santa's Village Corporation. Billawalla eventually declared bankruptcy in 1977, hoping to recover his expenses and reopen the park as a second Knott's Berry Farm in the north, but the City of Scotts Valley rejected this idea. Suddenly desperate, Billawalla rebranded the park The Village, promoting it as an arts and crafts event space, but it attracted little interest. Scotts Valley demanded the park be brought up to code and also rezoned some of the space as residential, removing many acres from the site. Damage from a winter storm in 1978-9 crippled the park further. In 1979, operations in Scotts Valley came to an end and the entire park, including Santa's Express Train, were dismantled and sold. The property sat abandoned for over a decade until Borland International purchased the site. Besides a small collection of abandoned structures hidden in the woods, nothing really remains of the park except the State Route 17 highway exit "Santa's Village Road". Sadly, even that road is falling apart. The ultimate fate of Santa's Express Train is unknown. * All images of the train may be of the sister train that operated at the Lake Arrowhead park, which was also of the same design. Both parks were popularly known as Skyforest, causing endless confusion regarding attribution of photos. The Santa's Village property is off limits to all unauthorised visitors and trespassing is highly discouraged. Nothing of the rides or the train survive, only the original club house which sits in a very dilapidated and dangerous state remain on site. Relics of the park can be seen at various places throughout the Scotts Valley area, especially iconic multicolored toadstools that once littered the park. Grennier, Bobbie. "Santa's Village Scotts Valley". 2011. Kelley, Edward J. Personal correspondence. I'm interested in reserving this place because choosing the right venue which does not favor a specific culture becomes difficult. Halls here have fountains and elaborate pictures. Some San Francisco venues display traditional artifacts and paintings.